Is there going to be a wedding?! CONGRATULATIONS!! 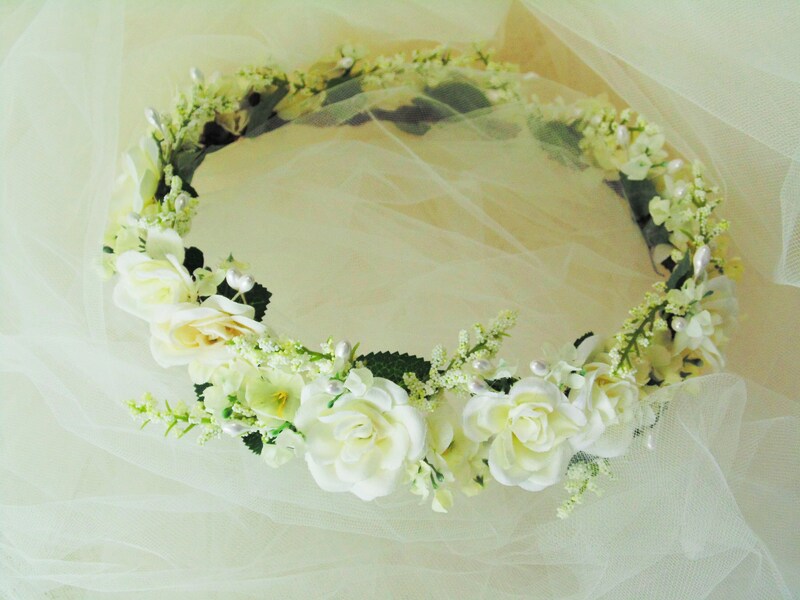 The Perfect Wedding Crown is in order! OOAK- FINISHED- READY TO SHIP. Hand decorated with Creamy White Silk Roses, two sizes of smaller creamy white flowers and PEARL ACCENTS. (see all Photos). A few green leaves and flocked stems are added for that NATURAL LOOK. GRAPEVINE BASE- BENDABLE/ADJUSTABLE for the perfect fit. This crown will go great with a White or Creamy White gown, as the flowers and accents are two-toned. *please keep away from small children due to small parts, please!